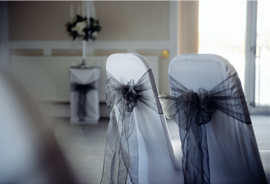 Every event – be it a wedding, christening or birthday – is unique, which is why all of our design options are tailored to suit your individual requirements and budget. This can range from simply providing you with a design for you to implement, to a comprehensive service where we create the design, source everything, and set up your venue, removing the stress from at least one aspect of your special day. We will arrange to meet with you to discuss your thoughts, ideas and aspirations for the event, and to help you decide which of our design packages best suits your needs. If you have already decided on a venue, or have somewhere in mind, this is usually a good place to meet. We will be able to talk through your plans, whilst also being able to realistically consider how they will work in the setting. This first meeting gives you the opportunity to better understand what Design My Day can do for you, and also allows us to learn more about the decisions that you have already made. Information on date(s), time(s), venue(s) and numbers will help us begin to determine the design and styling that will be perfect for you. If you are just looking for inspiration and ideas, we can provide a detailed design for you to implement at your venue. The design will cover everything from the colour palate and lighting, to creative ideas for table centerpieces and flowers. We can also include advice on appropriate finishing touches, such as place settings and/or favours. Whilst sourcing and acquiring the various elements of the design can be done well in advance, an important consideration is who will ‘pull it all together’ on the day. It may be worth investigating whether the venue has an Events Co-ordinator who could take on this role. This package aims to help you implement our design yourself, without the need to spend hours trawling the Internet in search of specific items. As well as providing a detailed design (as explained for the Simply Style package), we will also supply comprehensive details of how and where to source all the elements required to create it. The actual implementation of the design is still something to bear in mind, though, as it can often require several capable and experienced ‘pairs of hands’. Creating a truly breathtaking venue requires months of planning, research and organisation: time that most busy people simply don’t have. We will work with you to create a complete venue design. We will then go through this with you, in detail and on site, to ensure that every aspect of the styling is addressed, agreed and finalised. Once you are completely happy, we will source and cost everything required, providing you with a full breakdown for approval. On the day, our team will be at the venue to create the design, ensuring that nothing is left to chance. This service will include everything from ensuring the room layout is as agreed, to dressing the tables, arranging the centrepieces and place settings… and even lighting the candles. All you will need to think about is what to wear! This package will involve regular meetings and discussions in the preceding months and weeks, to ensure that everything is absolutely perfect for you on the day.